Our Passport Facility is open to UH students, staff, faculty, and the general public. With the Passport for Coogs initiative, current UH students may be eligible to have the cost of their U.S. passport book ($110) reimbursed! To see the Passport for Coogs video, click here! The Learning Abroad office at the University of Houston has been officially designated as a U.S. Passport Acceptance Facility by the U.S. Department of State. As such, our acceptance agents are authorized to receive and execute your application for a U.S. passport book and/or passport card. It is also important to understand that only the U.S. Department of State can determine eligibility for a U.S. passport. It is ultimately the applicant's responsibility to have the proper documentation to apply for a U.S. passport. Please visit travel.state.gov or call 1-877-487-2778 for more information. Appointments are required. Please call 713-743-4687 to schedule an appointment. If we are unable to answer the phone, please leave a message and we will contact you as soon as possible. Appointments are required with the exception of walk-in Fridays. The UH Passport Acceptance Facility does not process renewals as these must be completed and mailed in by the individual. Detailed instructions can be found online here. Exception: Students who are elligible for the reimbursement must process their renewal in our office to receive the reimbursement. Learning Abroad will still provide UH students, faculty, and staff a free photo to send in with their application; please call ahead to schedule photos. 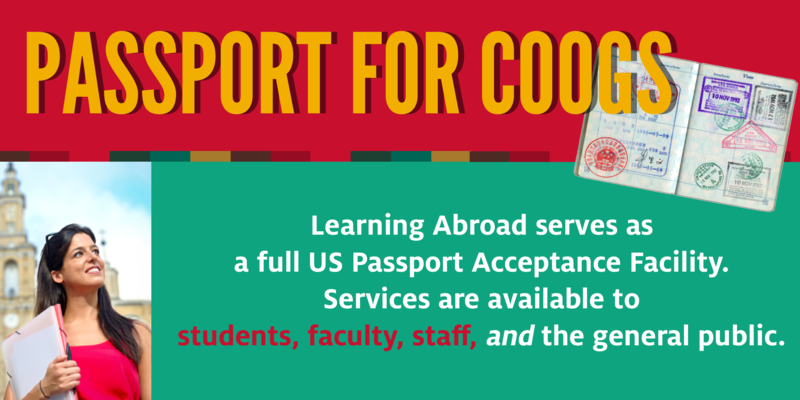 The Learning Abroad Passport Facility now accepts walk-ins for passport applications on Fridays. The first applicant will be seen at 8:30, and we will stop taking applicants based on volume. Please remember that we are a half-day facility. The U.S. Passport Acceptance Facility will not be open on federal holidays, scheduled university breaks, or during emergency university closures. Visit the UH Calendar for up-to-date information on regular university closures. Please note that our facility only accepts check or money order as form of payment and that fees paid to UH (as applicable) must be on a separate check or money order from U.S. Department of State fees. The most up-to-date approximate processing times are located here. These are approximations and the UH Passport Acceptance Facility cannot guarantee processing times. Please note that the UH Passport Acceptance Facility is unable to mail applications via Express Delivery, however applicants can add Overnight Return Delivery for an additional fee. If you are traveling within 2 weeks, you will need to contact the Houston Passport Agency at 1-877-487-2778 to make an appointment with them, as the UH Passport Acceptance Facility cannot process applications for passports needed within 2 weeks. Applicants whose names differ between their proof of citizenship and proof of identification will also need to show proof of legal name change, such as original marriage certificate or original court order showing the name change. Originals will be submitted with application and returned to you via USPS by the U.S. Department of State. Photo identification must match the current name, which should also be on the passport application. A birth certificate * must be provided each time a minor is applying for a passport, even if they hold a previously issued U.S. Passport. The minor must be present at time of application. Valid photo identification is required for each parent who is listed on the birth certificate of the minor. A photocopy of front and back of parents' valid identification is required. Any parent listed on the birth certificate must be present at time of application (with valid proof of identification for each parent). If out of state license, a secondary form of identification such as work or student identification card or Social Security Card must be provided. If one parent is unable to come to the appointment, the parent who is unable to come to the appointment must complete a DS-3053, the Statement of Consent, PER MINOR, and submit a color photocopy of the front and back of valid identification. The Statement of Consent must be notarized. This documentation will be submitted with the minor's application. Document must be completed in its entirety before notarization. Edits cannot legally be made once the form as been notarized. If one parent is unable to come to the appointment and that parent is unable to complete a DS-3053, the parent who attends the appointment must complete a DS-5525, the Statement of Exigent/Special Family Circumstances. If one parent is deceased, the original Certificate of Death must be provided. Original will be submitted with application and returned to you via USPS by the U.S. Department of State. If there is an official court order granting custody of the minor to another party, the original court order must be provided. If the above applies to you, please continue below. If you do not qualify for reimbursement, please disregard the rest of this collapsible panel. Our passport facility is located on the University of Houston main campus in the Learning Abroad Office: Ezekiel W. Cullen Building, Suite 105. The Cullen Performance Hall, which has a large red UH banner above the entrance, does not connect to the Ezekiel W. Cullen Building. Please do not use this entrance. Paid visitor parking is located in the University of Houston Hilton Hotel Parking Garage (garage entrance on East side of building) or the Welcome Center Parking Garage. Our office is about a five minute walk from either garage. Check or Money Order ONLY. Temporary checks, credit cards, or debit cards cannot be accepted.